Elsie May Christian, age 93, died Thursday, January 31, 2019, at Robert Wood Johnson University Medical Center in Somerville NJ. Born May 9, 1925 in Landis NJ, Elsie was the daughter of the late Harry S. and Elsie (Brayman) Maynard, Sr. She lived most of her life in the Bridgewater NJ area. Elsie was a Secretary for Postal Telegraph, Western Union, and retired from Thermionic Products in North Plainfield NJ after many years of work there. Elsie also loved nature and being outdoors, watching deer go through her yard and the goldfish in the pond at her home in Bridgewater. She and her late husband, Jack, would travel often in the summer to Cape May NJ for rest and relaxation. 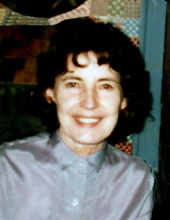 In addition to her parents, Elsie was predeceased by her sister, Nathalie Kemp in 2007, her brother, Richard Maynard in 2018, and her husband, John A. Christian in 2006. She is survived by her brother, Harry S. Maynard Jr., as well as several nieces and nephews. Funeral services will be held at 11:00 am, Tuesday, February 5, 2019 at Holcombe-Fisher Funeral Home, 147 Main Street, Flemington NJ. Interment will follow in Prospect Hill Cemetery in Flemington. Calling hour will be from 10:00 am until the time of service at the funeral home. In lieu of flowers, donations in Elsie’s name may be made to the Wounded Warrior Project, P.O. Box 758517, Topeka KS 66675. "Email Address" would like to share the life celebration of Elsie May Christian. Click on the "link" to go to share a favorite memory or leave a condolence message for the family.